HomeDowntown Wayne businesses speak and Wayne Main Street listens! Downtown Wayne businesses speak and Wayne Main Street listens! Over the past year volunteers on Wayne Main Street’s (WMS) Business Empowerment Committee have been conducting in-person surveys at all of the downtown businesses located in the Main Street district (Exhibit A – WMS District Map). The purpose of the survey was to not only introduce ourselves to the business community, but to learn how the Main Street program can best serve the small businesses located in Downtown Wayne. The results of this survey are being used to plan appropriate programming and events that cater directly to the business community. The questions asked were simple, and the answers given were extremely helpful. WMS would like to thank all businesses involved in the survey for cooperating; it has provided important insight that is highly valued! Please note that all responses were the voices of the business owners and may not represent the opinions or views of Wayne Main Street. Question 1: How can Wayne Main Street help you with your business? Question 2: What types of seminars or training would you be interested in attending? Question 3: What day of the week works best for training/workshops? Question 4: What time of day works best for you? Question 5: What type of new business would you like to see in Downtown Wayne? Question 6: Do you know anyone who owns a business elsewhere who is interested in opening up a second location or wants to relocate? Question 7: What is the best way to contact you? Questions 8: Would you like to be more involved with Wayne Main Street? In response to information gathered from this survey, WMS has been working towards catering to the local business community’s needs. Last November, WMS hosted the first annual Small Business Saturday event and plan to continue this effort each year to promote shopping locally for the holidays. The first annual Holiday Window Display Contest was another success last year that helped light up Downtown Wayne for the holiday shopping season. Additional promotional events are in the planning stages and include a Chocolate Walk event likely to take place next Valentine’s Day. 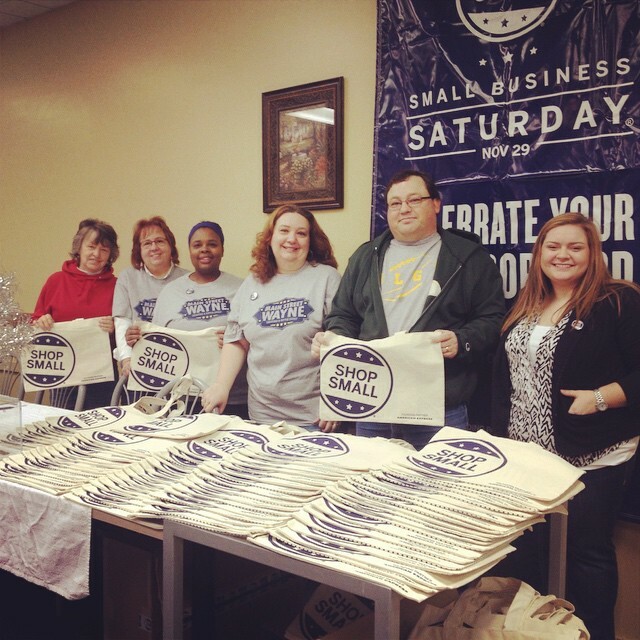 Volunteers at Nick’s Coney Island during the Small Business Saturday event last November! In March WMS hosted a business workshop called “Let’s Put Wayne on the Map!” in partnership with Google to increase business’ web presence on Google Maps. The next business workshop scheduled for Tuesday, June 23rd at 6:00 PM will feature Jacob Schroeder from Pure Michigan Business Connect and a city representative to answer questions about Wayne’s sign ordinance. Business workshops are open to all businesses located in Wayne! Efforts to fill vacant buildings downtown are multifaceted, but one project that is currently being planned is an event called “I Wish This Was…” to showcase a vacant building and host a mini community visioning session inside or near the property. Details will be announced soon! Another program that Main Street launched this year is the Facade Grant Incentive Program available to property owners in the Main Street district to “bring history back to downtown storefronts” while encouraging private investment. So far two applications have been received and an announcement will be made this May about the first recipient of this funding! Downtown Clean Up Days have been planned over the past few years by Wayne Main Street, and more are sure to come! This year WMS strayed from the Spring Clean Up because another group expressed interested in spearheading the effort. However, a clean-up day after the US12 Cruise is likely to be scheduled soon. Stay tuned for details! 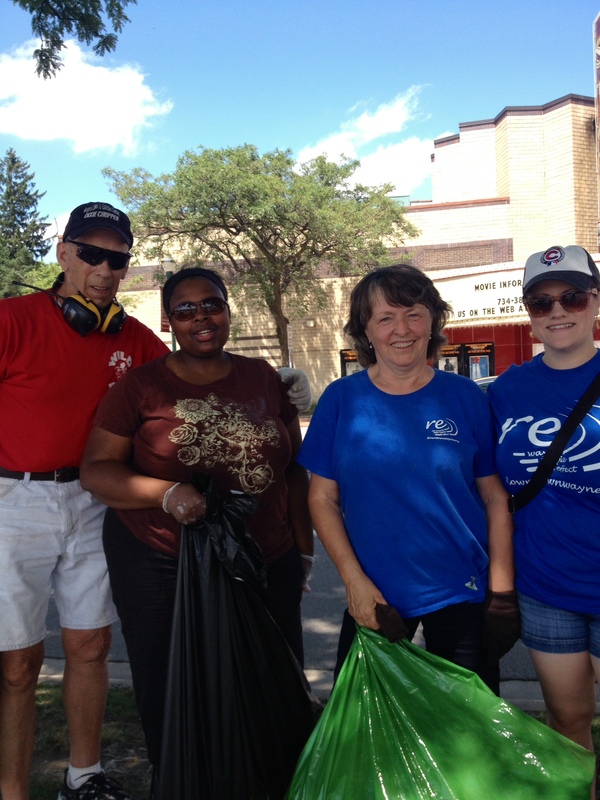 Volunteers cleaning up Downtown Wayne after the US12 Cruise last July. Needless to say, there is still plenty of work left to do. Wayne Main Street is a completely volunteer driven, non-profit organization that depends on community support through financial commitments and time given. Please click here to find our how you can help make a difference. If you don’t have time to spare but want to help revitalize historic Downtown Wayne, please take a moment to make a tax-deductible donation online or by mail (Post Office Box 327 Wayne, MI 48184). Wayne Main Street’s Executive Director, Lindsey Wooten, is happy to answer any questions you may have about this article or the Main Street program. Feel free to call (734) 629-6822, or stop by the Main Street Office located inside the “Wayne Activity and Banquet Center” at 35000 Sims Street during open office hours (Monday-Friday 9:30 – 11:30 AM) or by appointment.